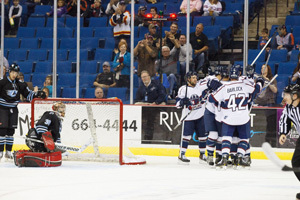 TULSA, OK—In the sixth round of a shootout between the Tulsa Oilers and St. Charles Chill on Saturday night Tulsa forward Drew Fisher scooped up the puck off the center ice spot and skated in toward goalie Robert Moss in the St. Charles net. After faking a shot attempt Fisher allowed the disc to dangle invitingly on the end of the paddle and waited patiently for Moss to commit. Once he did, he flipped it over the now prone Chill goaltender and into the net, scoring the game winner for the Oilers and pushing their current win streak to four-in-a-row dating back to November 3rd. It was definitely a tale of two games between the 6th place Oilers and the 8th place Chill, where in game one on Friday night Tulsa dominated early, then after a goalie change in the early stages of the second period almost allowed St. Charles back in the game before sealing the deal with two quick goals in the game’s final minutes. Saturday night saw the Oilers score in the middle of the first period, hold the lead through the second and see the score tied twice in the 3rd period. The overtime session saw the two teams’ trade power play opportunities but no goals leading to the shootout. Jordan Fox and Steve Makway scored goals for the Chill in the shootout while Michel Beausoleil and Ben Gordon scored for the Oilers before Fisher found the net in the sixth round, which is the first round of the sudden death shootout. Scorers in regulation included a team leading 6th goal of the season by Adam Pleskach and Todd Robinson third goal for Tulsa, and Steve Makway and Kyle O’Kane for St. Charles. Makway and the Oilers Craig Cescon hooked up in a fight in the first period. The second period saw the Chill’s Greg Brown and Kyle Bochek from the Oilers engaged in fisticuffs. In addition to those major penalties Ryan Cramer earned an early trip to the showers after he committed a violent check from behind with 29 seconds remaining in the second period. It was a much more physical game on Saturday night than it was on Friday. The Chill’s power play was ineffective against Tulsa’s penalty kill, which allowed one goal while shorthanded. The Oilers penalty box was a popular destination as the team totaled eight minors and three majors for 41 minutes in penalty time. Tulsa had been averaging 19.0 minutes in penalties per game. The Oilers got their opportunities on the power play, but did not convert any of their 10 chances. The Oilers improved to 4-5-2 on the season are in the double digit points club with 10 standings points. St. Charles earned a point for the shootout loss, and falls to 2-5-2 with 6 standings points, the Chill are still searching for their first win on the road this season. Tulsa will take on the Wichita Thunder on Tuesday night while St. Charles will entertain Arizona at home on Friday night, the first of two home games with the Sundogs next weekend. Tickets for Tuesday nights game with Wichita and all remaining Tulsa Oilers home games are on sale at the BOK Center Box Office and at the Oilers office 9128 E 46th Street (46th street between Memorial and Mingo. This entry was posted in Sports on November 10, 2013 by admin.